It has been a long 18 months, lots of work on Hannah, lots of paid work for Bee, less for me, but sat over the inevitable evening glass of wine (now home brewed) there is a feeling of satisfaction at the changes we have made - improvements all. 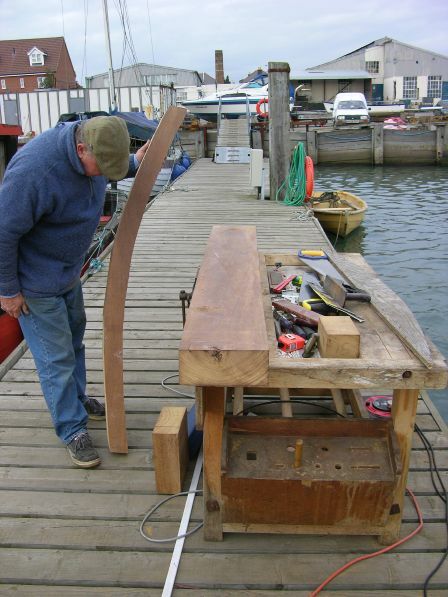 Engine and gearbox sorted, doghouse built, new sails with the addition of a trys’l and small storm stays’l (NOT that we will ever need them….) and so on. Here’s a brief rundown on the efforts to date. One of its great assets was it enabled us to get on with work as it tended to hide us from passers by and although work progressed slowly we were moving forward. 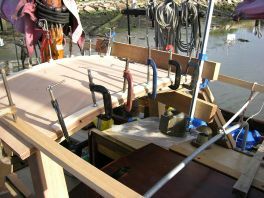 Of the many jobs we had to tackle the repairing of various bits of hull damage was fairly prominent. Long time readers will, perhaps, remember the stories of hitting lumps of French granite and being assaulted by a runaway iceberg. 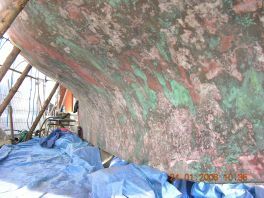 The latter was relatively easy as the damage was confined to the epoxy that had been used to fair the hull. The granite damage proved a different problem as the cement we had used had set so hard it refused to crack with a lump hammer and bolster and eventually we gave up and decided it was sound enough. We ground it back to give a smoother finish and declared ourselves satisfied. The wonder of concrete hulls…. 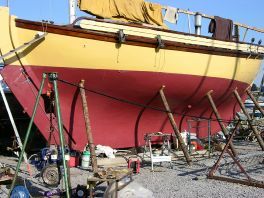 And the wonder of the use of the shower on Larus (Tim and Nancy’s boat) to rid ourselves of the inevitable cement dust that accompanies the grinding back of the hull. 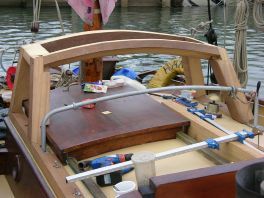 Their purchase of a flat couldn’t have come at a more timely moment either and they may never fully understand our appreciation.... Other tasks we came across were rot in the bridge-deck and the bottom of the mizzen and touches of rot in the main. All repaired with varying degrees of difficulty. 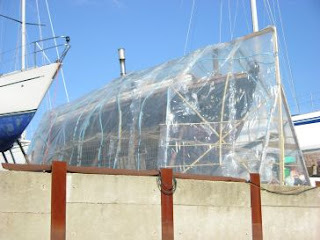 “Stan” became the focus of our attention as we bombarded Paul with numerous changes we felt we needed – almost entirely to stiffen up and make it more storm proof. The re-launch day came and went without us and we settled for a more expensive sole launching later in the year. 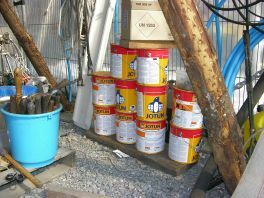 We contacted a supplier for Jotun paints, checked the colour on the internet and were suitably horrified when we opened the tins to confirm…going back to the internet we noticed a small notice which indicated that colours shown on screens, because of the limitations of computers, bear little resemblance to reality. Well ok it wasn’t quite like that but certainly the gist. Reactions varied from “the contents of a babies nappy” to a “great colour to be seen at sea” with us firmly in the latter camp. 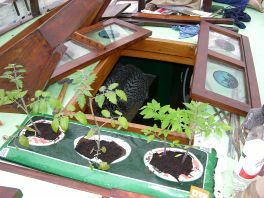 By May, with the sun high, we needed to remove the cover as temperatures would easily rise to 30ْC and above and even the tomato plants Bee had elected to grow seemed to wilt under the heat. We completed the paint and bright work, cleaned up the engine, replaced, with Geoff’s help, the timing belt and re-fitted the engine. By late July we were back in the water and towed back to our berth. Engine was re-connected, prop shaft and a new flexible stern gland fitted and with new wiring we fired it up and did it run well. All that thanks to John of course. 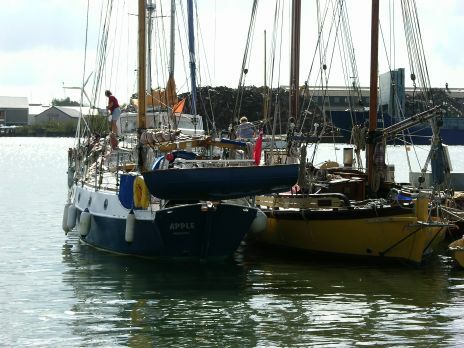 Smaller jobs were completed and then we got a surprise visit from Martin and Roma (the previous owners and builders of Hannah)in “Apple” a steel Wylo, their latest build (and last they assure us) Lots of neat ideas and high workmanship and great to see both boats together. Still prefer Hannah though. Actually we have had several visits whilst here. Ziggy and Lisa and then Stephen and Zella both visited, at different times, from the US and then my grandson Evan arrived towing his parents, Pete and Sarah, along to see the reprobates in the flesh. Quite a year! We measured, cogitated, re-measured and then ordered. I collected from the wood yard but was absolutely gob smacked at the size of the timbers and had a nervous chat with my mentor about the sizes – surely Noah couldn’t have had anything like these sizes? But we worked on steadily, me looking on, AD whittling away and slowly it came into being and, I have to say, is everything we could have wished for. The timbers are in keeping with the massive strength of Hannah and already we appreciate the difference as ventilation improves dramatically, the blessed Toots has somewhere to shelter and rain no longer means we have the hatch slammed shut. The sails! Well this was a saga that could have been from hell. We’d bought the material, found and bought an industrial sewing machine and a copy of “The Sailmaker’s Apprentice” A local hall was available for hire (£6.00 ph) and a mental (you choose which way it’s meant..) calculation of 200 hours to cut and stitch seemed about right. The weeks turned into months and Bee’s reminder that we (I) hadn’t started was met with excuses. Finally we sat down to work out a strategy which quickly established that perhaps we should give ourselves a head start and get the main made. 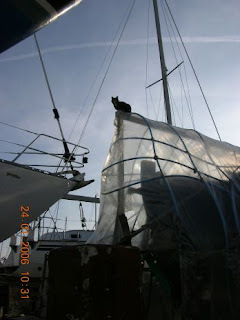 I phoned around to find a sail maker who would use our material. All I spoke to said “No” but many mentioned the name “James Lawrence” and so I rang. “Sure, No problem” After a couple of discussions with Mark Butler at JL we felt that perhaps we should just hand the whole job over and so drove over to Essex with our old sails. Watching the loft in action made us realise that we had been out of our depth here and the relief at handing the job over was palpable and enormous. Made more so when we told the sails we had asked for, 9 in total, would take 3 skilled people 3 – 4 weeks to complete…perhaps I needed to add a 0 to my calculation of 200 hours? Readers of earlier entries may remember our uncanny ability to find heavy weather whenever we’re “doing a long one”. 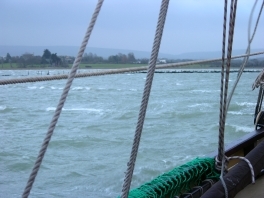 It’s this ability that we focused on when we were discussing the sails with Mark and the reason we now have deeper reefs in both the main and mizzen and a trys’l and storm stays’l for those moments when the call of the sea is replaced with the call of the 9-5…………. As yet we have had little chance to try them out other than for a few hours but we’ll report in due course. A tale or two…. I’m in the engine compartment, clarting around and Bee is putting the kettle on. 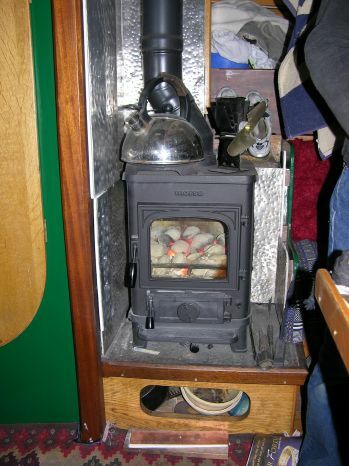 As you are possibly aware we have a Taylor’s Paraffin Cooker which is preheated before igniting. Bee was in this preheat process and turned to the fuel tank to pump up the pressure, turned back and was confronted by a small wall of flame. “I think you should come here” sayeth the dulcet toned one………. :”I think you should come here NOW” It was the slight emphasis on the last word that alerted me to the fact that something might be amiss………. We dumped a fire blanket over the flames, blasted it with an extinguisher and retreated up top. Gazing at the white fire blanket I could see a cherry glow and a gentle roaring sound and rushed down the companionway. Peeking under the blanket, holding my breath against the fumes I can see the fire is definitely not out. In one of those strange coincidences in life Bee had come back from Asda the night before and announced that the shop had fire extinguishers and, as ours were mostly out of date, perhaps we should get a new one. Oddly enough instead of prevaricating as I usually do we had gone in that morning and bought one. And, of course, it was this brand new extinguisher I’d grabbed and squirted over the blanket. This time I lifted the blanket and emptied the remains of the contents across the cooker…………. Well they do make a mess but more importantly they work very well. Obviously we needed to replace that and buy more but timing is all it seems. The fault by the way can be traced to the eejit I employ to keep the cooker in fine fettle i.e. ME. I had allowed a locking nut to work loose (or more likely not done it up tight enough) which had allowed a fuel leakage and then the fire. Paraffin is a MUCH safer fuel than gas and has in no way altered our view of the cooker. Other than to make sure all necessary work is done properly and in good time. And then one day passing the rubbish bin, as usual full to overflowing, I spotted a wine box lying on top of the rest of discarded items. Ever curious I shook it and was rewarded with a carton at least half full….as a matter of academic interest I checked the sell by date and startled to see it was only the day previous. Of course we drank it – kept us going for several days. With the many nights we have spent at anchor over a variety of seabed’s you will appreciate how dear to our hearts a good anchor is. We’d used a 45lb CQR and a 56lb imitation CQR and whilst the heavier one was much better we were aware that in very strong blows, despite a long scope and a religious fervour when setting the damn thing, Hannah had a tendency to creep. By creep I mean that the wind and wave strength would combine to gradually move her across an anchorage, despite being, apparently, well dug in. It might only be 60 feet or less but it happened. It may be the effect of tide or wind changes but it happened. Where the anchorage is wide and loads of sea room it isn’t a problem but it is something else we have to concern ourselves with. 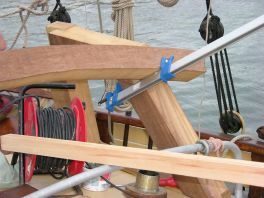 Over the years we had become almost fanatical about our anchoring technique and would set and reset if we had doubts about the holding. Better to do it then than face a gale and a dragging hook. Then we read about an anchor that seemed too good to be true. Sets first time (another bone….) and just keeps digging in. Intrigued we contacted the Kiwi company and did some more research and then decided to buy. This time we have gone larger still (33kg or 73lbs) and the short trial we had in Newtown has so far confirmed we made a good choice. It set first time on the 3 occasions we dropped it and set it that wonderful, heart warming way that forces the boat to swing immediately toward the anchor, irrespective of the way she is falling off. Yes, I know Newtown is a good holding and that the anchor is heavier than those we have used before but with our experience to set as the ROCNA did and for Hannah to sit without any creep, on a short scope, when the wind strength was so high is unprecedented. We look forward to trying it out on a variety of beds. Watch this space.